Nearly everyone I know in Berlin furnishes their home with fixins’ from Ikea. We do the same but we work really hard at making it look like it’s all been pieced together from more interesting places. One of the ways I contribute to this is by making stuff to accent our Ikea swag. An area of our home that’s been bothering me recently is under foot. We’ve purchased more than several rectangular cotton area rugs from Ikea because A) you can machine wash them, and B) they were inexpensive, the smallest of them costing just €1.99. As other areas of our home have a more ‘cottage’ than an ‘inner city apartment’ vibe, those rugs stand out looking strictly utilitarian and decidedly Ikea. 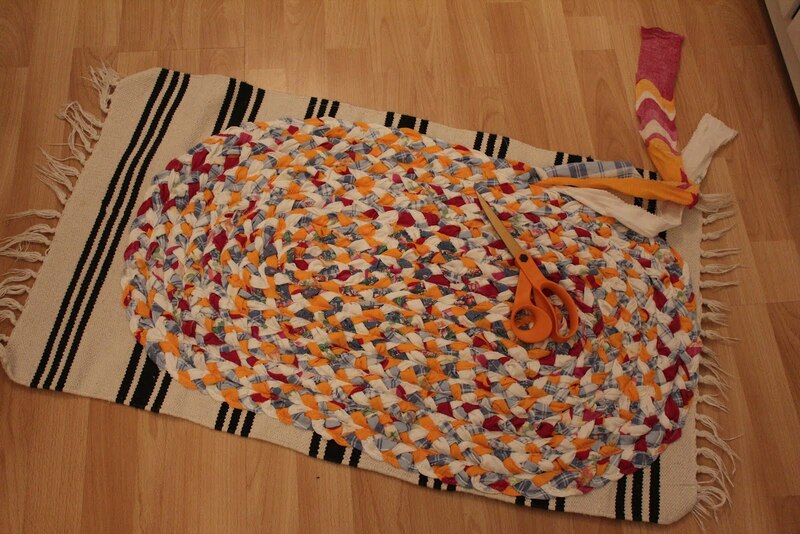 Remedy: Last week, I decided to try my hand at making a braided rug. These rugs remind me of ones my parents had in the 1970s when my mother was going for an “Early Americana” decorating scheme. I enjoy more than my share of Early Americana and thought this look would be fab in our inner city cottage. 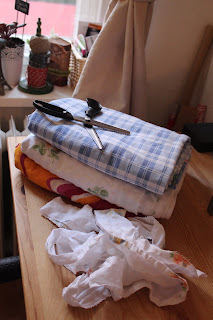 Finding some tutorials online and in books, I discovered the best rugs can be made from scraps of fabric and old linens, giving them their common name, ‘rag rugs.’ This speaks to my inner recycler and budget minded crafter. There are few things more satisfying than making super cool things out of forgotten or discarded materials, no? 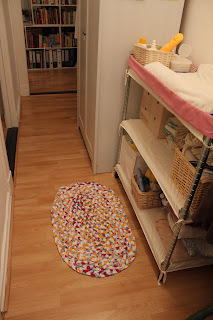 To top it off, I was able to use one of those €1.99 Ikea rugs as a backing for my braided rug. Waste not want not, I always say. The following is not intended to be a complete tutorial. The tutorial I took the most advantage of can be found here. While its narrative is a little confused, the pictures are clear and directive. 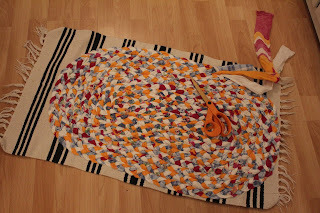 I plan on making a larger braided rug for my living room at some point and will use Amanda Soule’s lovely tutorial from her book Handmade Home. Soule’s tutorial is more earnest and involves ironing the strips of fabric and hand sewing the braids with a carpet needle—things I didn’t want to mess with my first time out. 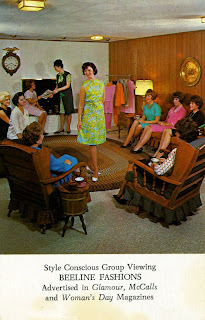 Note: My finished product has more of a ‘rag’ profile than the tidy, glamorous rug in the 'Beeline Fashions' photo above. I’ll take the extra time when making the larger one in my living room per Mrs. Soule’s instructions. The tutorial I followed had used old sheets. I found these three cotton duvet covers at a second hand shop for €1.50 each! 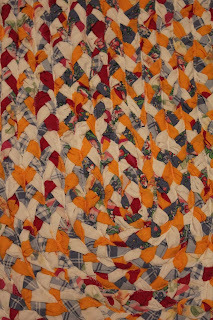 Using pinking shears, I cut the fabric into strips about two inches in width, eyeballing the measurement. 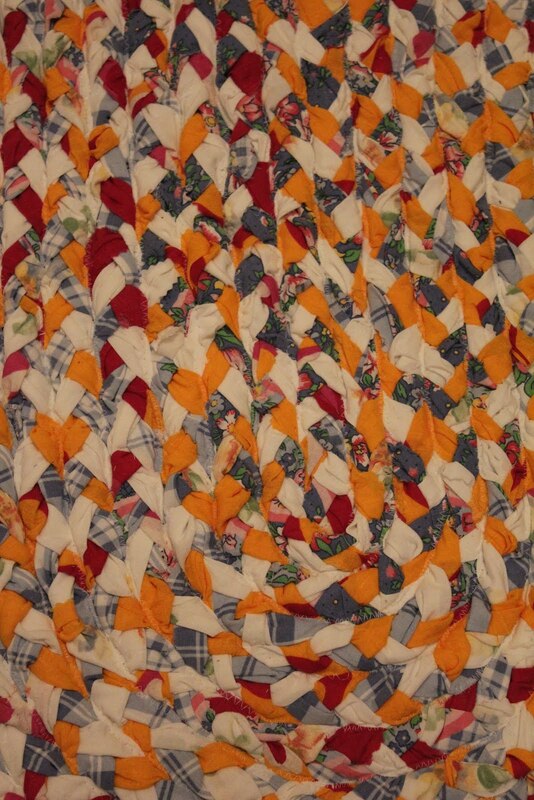 The length of each strip was inconsequential. 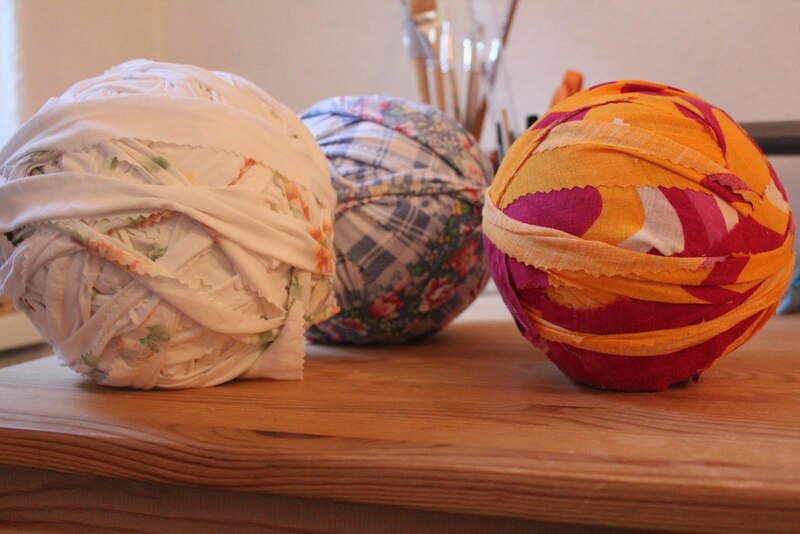 I wrapped all the strips around one another to form these awesome spheres, really end products in and of themselves. I took a strip or strand from each of the three spheres and stitched one of their ends together. 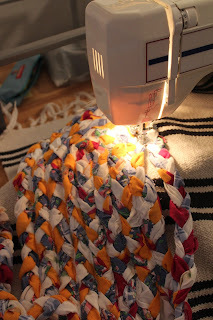 Safety pinning the stitched end to my ottoman (or any soft furniture) so I would have something to pull against, I began a basic three strand braid, like one does with hair. When I came to the end of a strand, I cut a small slit into each adjoining strand and threaded them together—this step is explained in more detail in the online tutorial I reference above. Cautionary Tale: As much as I wanted to join several strips together at once to make them longer so I wouldn’t need to continually stop braiding, I found it more annoying and time consuming to manage the longer strips while weaving. 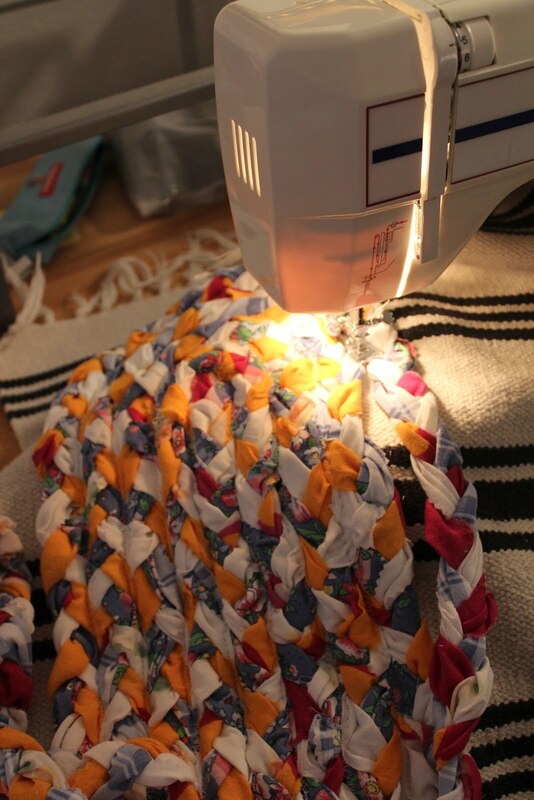 I spiraled my braid atop my Ikea rug and sewed the edges together with a zig-zag stitch on my sewing machine. 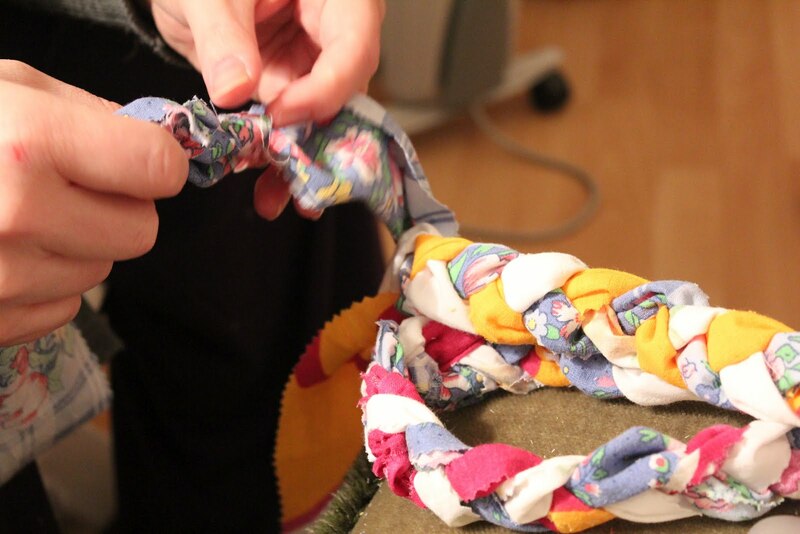 Next step was to cut off the excess Ikea rug and sew the end strands beneath. Voila! This little oval rug (or slightly bean shaped rug?) will live in front of my son’s changing table, which happens to be in our hallway. My fabric strip spheres are still plentifully round and I plan on making a circular version for his play area. Beeline Fashion photo source can be found here. that was me, kelly, btw. I continue to appreciate the multitudinous ways you create useful art with simple found objects.